Winter is on its way, and the air will be getting just a little too chilly to enjoy your boat, unless you go south for the winter. For those of us who remain on the Bay during the winter, we will have to put our boats on the hard for a (hopefully not too long) winter’s rest. However, having your boat in winter storage, is always a perfect opportunity to make some upgrades to your boat that you will get to enjoy next season. The Marine Service Crew at Norton’s has put together a few examples of awesome service projects they can do for you this winter. Give your boat’s appearance a little something extra. Let our professional paint crew treat your boat to a new boot stripe from our line of Awl Grip paints. At Norton’s we can upgrade your alternator to a Balmar 6 series. This alternator uses an internal regulator when used as a direct replacement for a Yanmar alternator, it can also use an external 3 stage smart regulator, or we can wire in a switch so that you can choose between both options. This is an excellent addition to any cruising boat as it offers redundancy in the event of a regulator failure. The bottom right photo is showing the simple installation of an external Balmar ARS5 regulator and a typical selector switch box to choose between internal and external regulation. In the winter months, we always like a good restoration project to keep us busy. We recently painted one customers hull sides with Midnight Blue Awl Craft 2000. Here are a few photos of the painting process. First, we prime the boat with grey primer and then fill in any imperfections. The next step is to apply another coat or two of 545 Awl Grip epoxy primer. This surface is then sanded fair to allow good adhesion of the top coat paint.The chosen top coat for this boat was a very dark blue in Awl Craft 2000. Towards the final stage, she has three coats of a beautiful “Midnight blue”. To finish the paint work we added a gold accent stripe at the window line, then a raised white boot stripe was painted to match the decks. The decks and cabin sides were detailed and repaired with new gelcoat to make them as good as new. With a new coat of bottom paint and a new name decal on the bows, this boat left our shop looking as good as new. 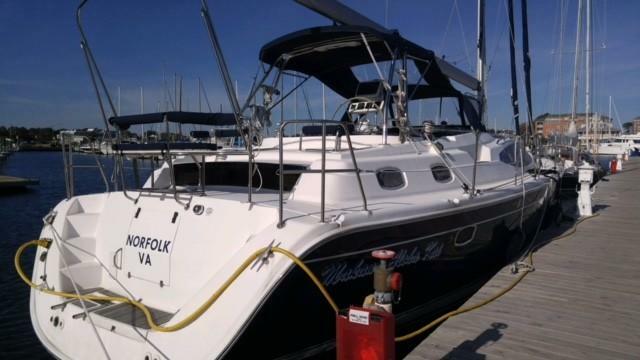 At Norton Yacht’s we offer expert paint services and detailing. If your paint surface has lost its luster, we can often restore it to its former beauty with some compounding and a little wax. In the photo below, you can see the brilliant red paint finish below the rub rail. When the boat arrived for some paint service the entire surface was milky looking as it is in this photo above the rub rail. When she left our facility the whole red hull was bright and gleaming. Make your teak shine like new! This customer chose varnish for his stern seats. We carefully sand the teak smooth before applying several different teak oils on high traffic areas that can’t be slippery. The teak absorbs the oil completely giving the surface back its non slip quality, while maintaining the beautiful finish. Brush application of the first coat of teak oil to a transom gate. At Norton Yacht’s we install davits from Kato Marine. One of the Kato options is a stabilizer bar that can support solar panels. We can take care of the entire installation and when finished, these panels can provide 15 amps of DC power to your boat in direct sunlight! On our 50’ Marlow-Hunter sailboats we can offer a single bar dingy davit system that looks really sleek On the installation pictured below, we made some custom solar panel brackets and adjusters. We managed to squeeze two enormous solar panels in between the bimini top and the dingy davit giving the customer an extra 17 amps of DC power when tilted into the sunshine! You can reserve your spot for Winter Storage here! If you are in search of your dream boat that is both luxurious and functional, look no more! Makana Aloha Kai is a stunning bluewater passage-maker built for extended cruising and/or living aboard. Above decks, this center cockpit provides excellent visibility and is rigged for short-handed sailing. If you like to entertain, there is plenty of space to socialize in style. Down below, the large elegant main salon features opposing leather settees, has upscale wood work throughout, teak and holly sole, a convenient navigation station, and a fully equipped chef's galley with remarkable storage. Forward, the guest stateroom offers an ensuite head and a separate ensuite stall shower. Both staterooms are grand however, the aft stateroom is considered the owner's quarters. The owner's stateroom is extremely spacious and features a center line berth fully accessible on both sides of the huge bed, a walk-in cedar linen closet, a private head with shower, and an abundance of light. The owner's stateroom is masterfully designed to provide tons of space for livability and storage for long term cruises. This Marlow Hunter 50 CC is outfitted to the max with many options. You'd be very hard pressed to find a more luxurious dream boat. Once you see Makana Aloha Kai, you'll want to move onboard and immediately sail away or invite your friends over for entertaining....or, on this yacht you can do both!